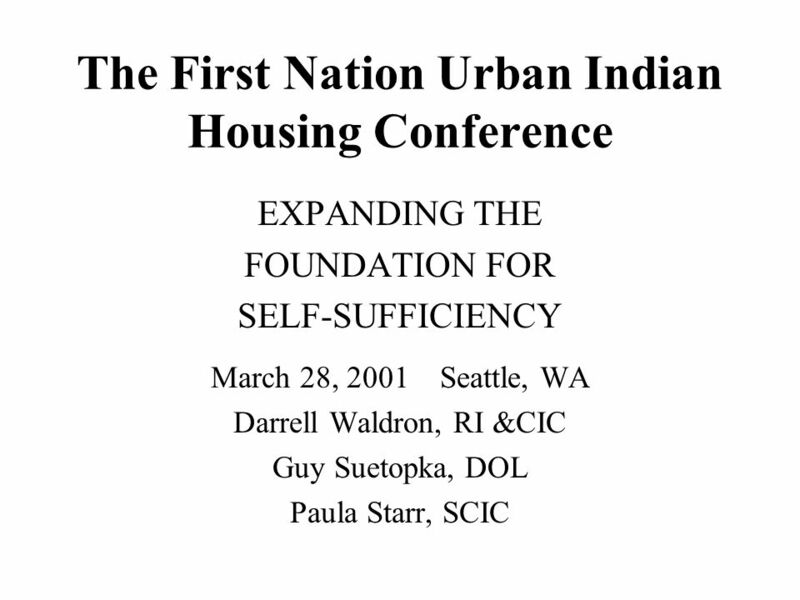 The First Nation Urban Indian Housing Conference EXPANDING THE FOUNDATION FOR SELF-SUFFICIENCY March 28, 2001 Seattle, WA Darrell Waldron, RI &CIC Guy. 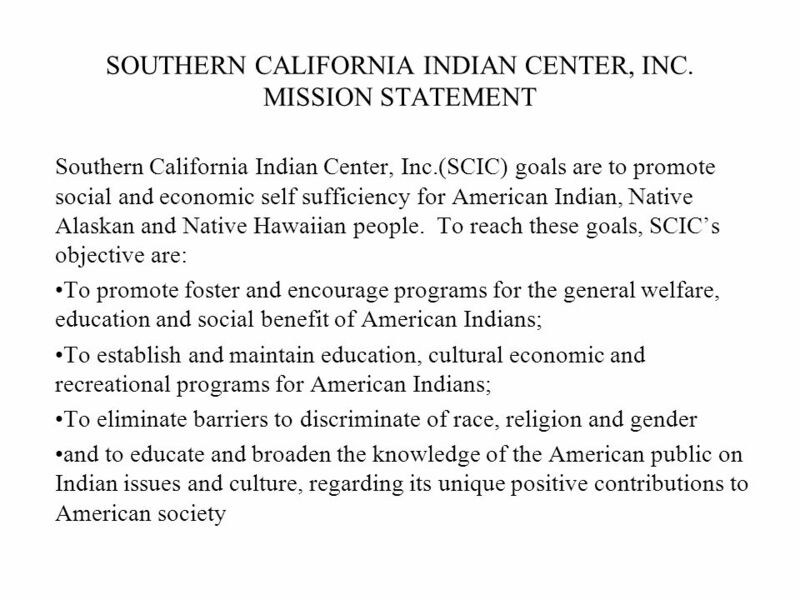 5 SOUTHERN CALIFORNIA INDIAN CENTER, INC. 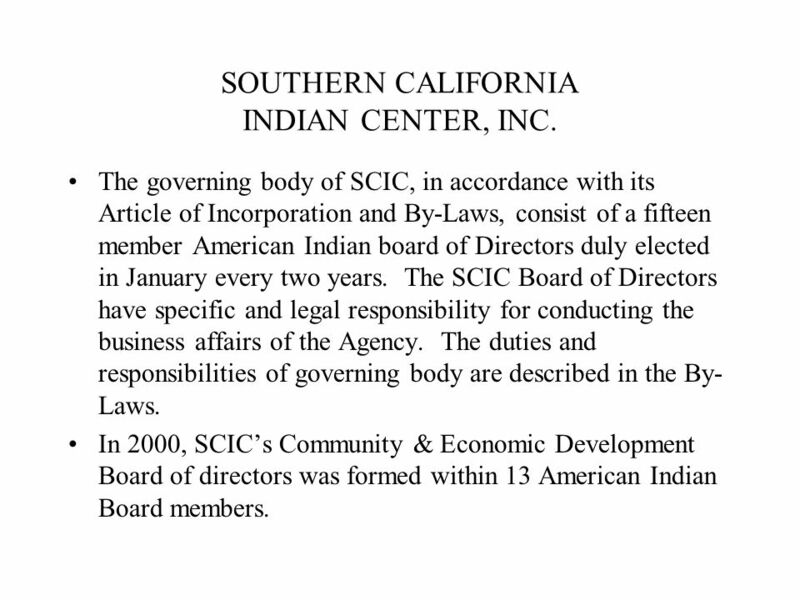 The governing body of SCIC, in accordance with its Article of Incorporation and By-Laws, consist of a fifteen member American Indian board of Directors duly elected in January every two years. The SCIC Board of Directors have specific and legal responsibility for conducting the business affairs of the Agency. The duties and responsibilities of governing body are described in the By- Laws. 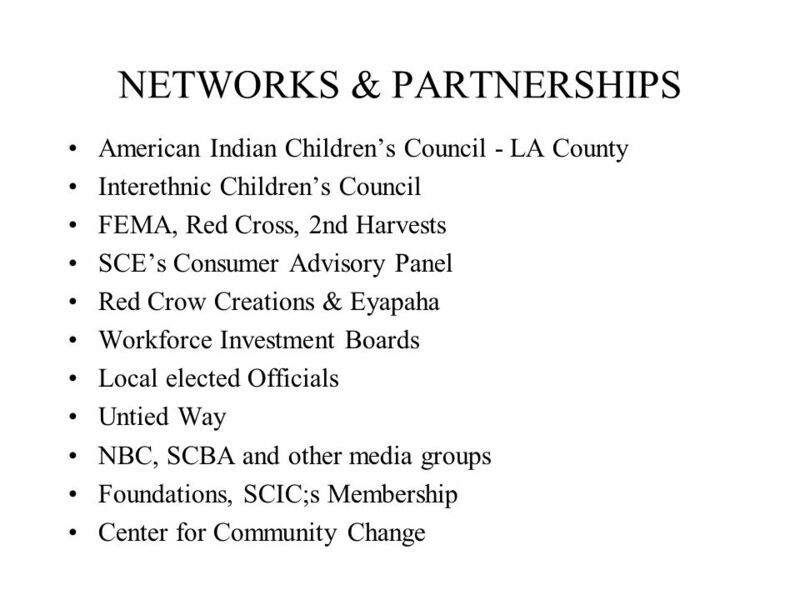 In 2000, SCIC’s Community & Economic Development Board of directors was formed within 13 American Indian Board members. 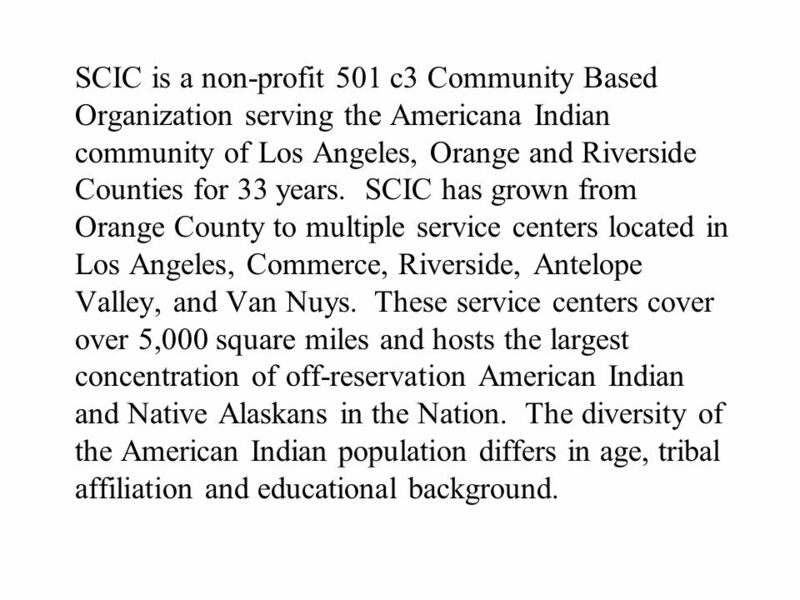 6 SCIC is a non-profit 501 c3 Community Based Organization serving the Americana Indian community of Los Angeles, Orange and Riverside Counties for 33 years. SCIC has grown from Orange County to multiple service centers located in Los Angeles, Commerce, Riverside, Antelope Valley, and Van Nuys. 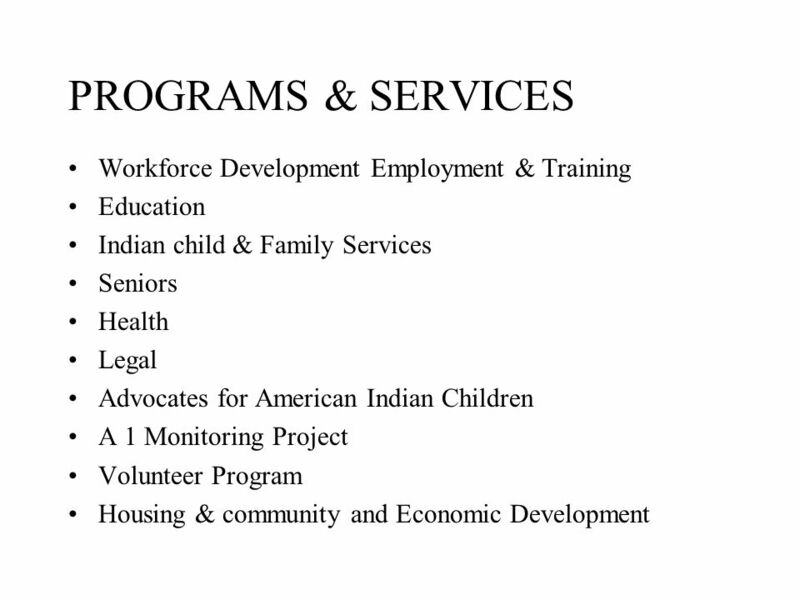 These service centers cover over 5,000 square miles and hosts the largest concentration of off-reservation American Indian and Native Alaskans in the Nation. 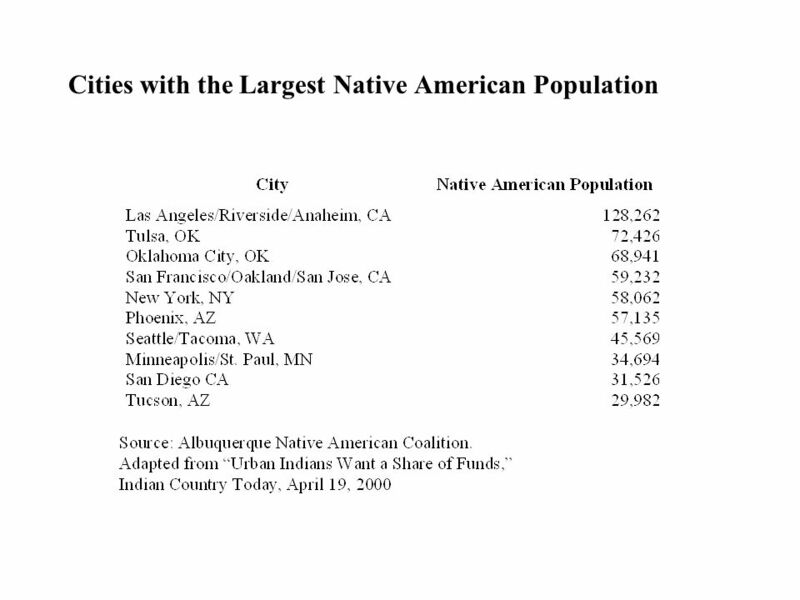 The diversity of the American Indian population differs in age, tribal affiliation and educational background. 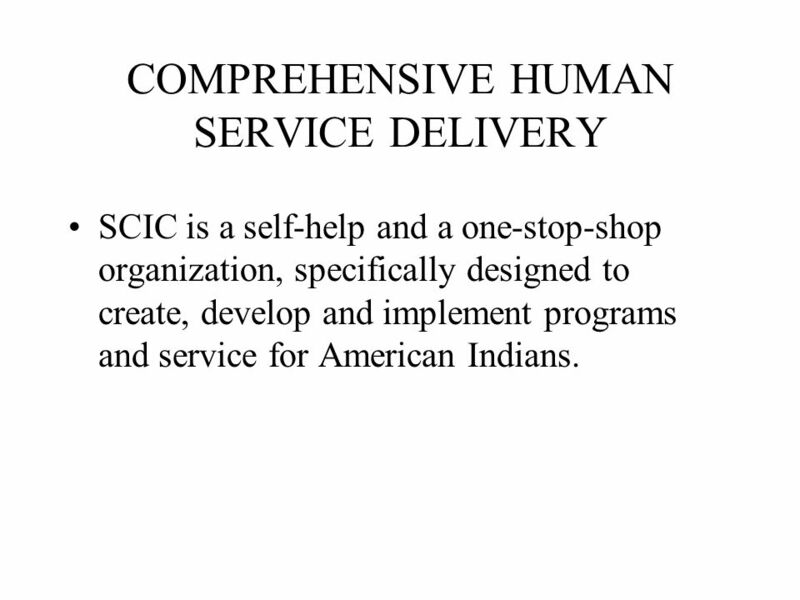 7 COMPREHENSIVE HUMAN SERVICE DELIVERY SCIC is a self-help and a one-stop-shop organization, specifically designed to create, develop and implement programs and service for American Indians. 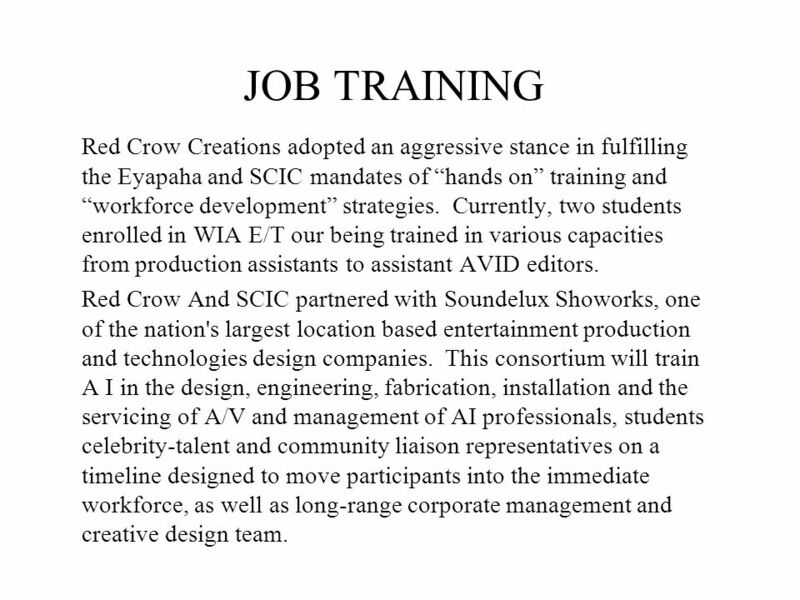 13 JOB TRAINING Red Crow Creations adopted an aggressive stance in fulfilling the Eyapaha and SCIC mandates of “hands on” training and “workforce development” strategies. Currently, two students enrolled in WIA E/T our being trained in various capacities from production assistants to assistant AVID editors. Red Crow And SCIC partnered with Soundelux Showorks, one of the nation's largest location based entertainment production and technologies design companies. 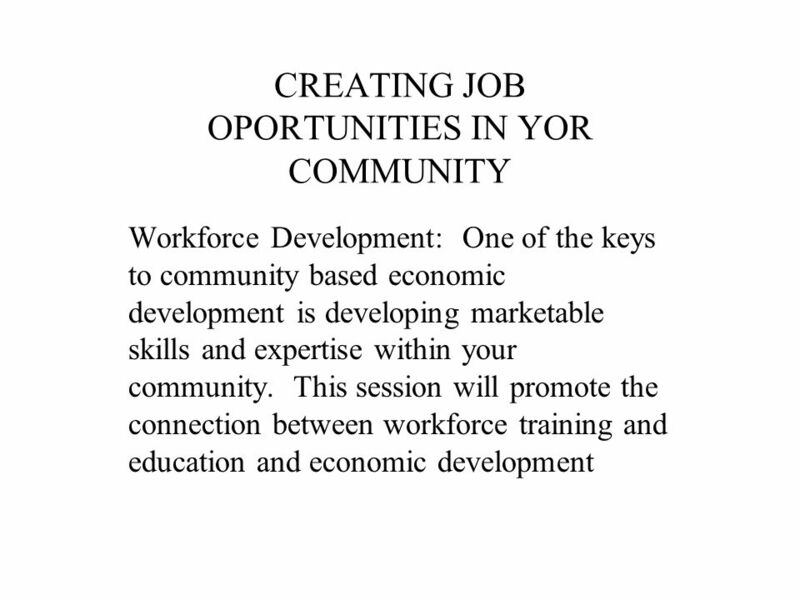 This consortium will train A I in the design, engineering, fabrication, installation and the servicing of A/V and management of AI professionals, students celebrity-talent and community liaison representatives on a timeline designed to move participants into the immediate workforce, as well as long-range corporate management and creative design team. 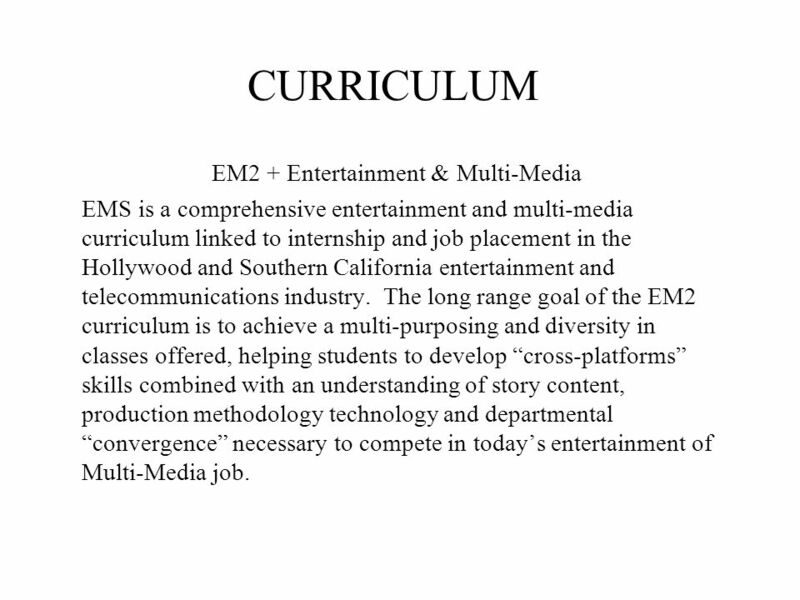 14 CURRICULUM EM2 + Entertainment & Multi-Media EMS is a comprehensive entertainment and multi-media curriculum linked to internship and job placement in the Hollywood and Southern California entertainment and telecommunications industry. 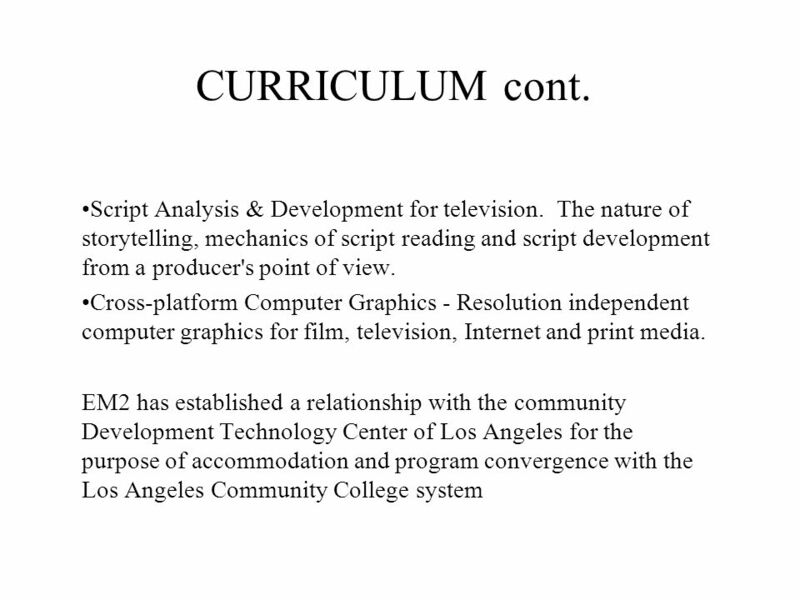 The long range goal of the EM2 curriculum is to achieve a multi-purposing and diversity in classes offered, helping students to develop “cross-platforms” skills combined with an understanding of story content, production methodology technology and departmental “convergence” necessary to compete in today’s entertainment of Multi-Media job. 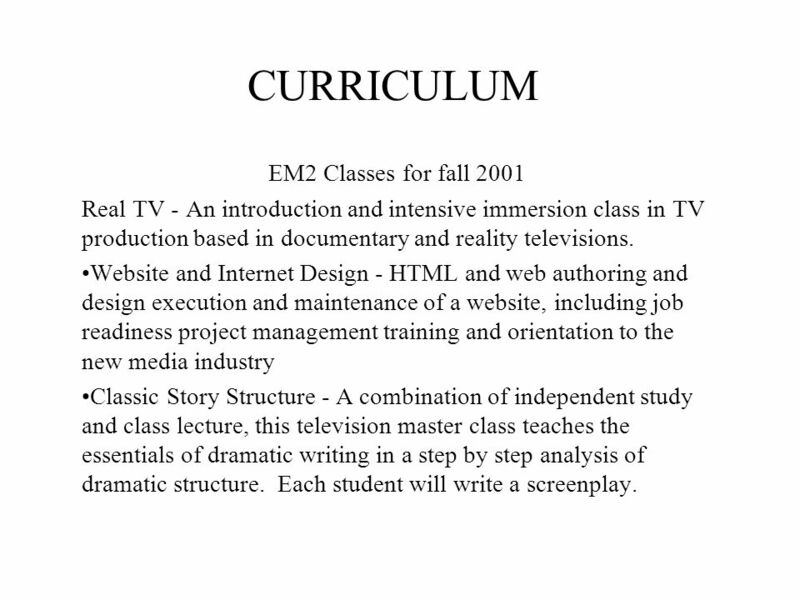 15 CURRICULUM EM2 Classes for fall 2001 Real TV - An introduction and intensive immersion class in TV production based in documentary and reality televisions. Website and Internet Design - HTML and web authoring and design execution and maintenance of a website, including job readiness project management training and orientation to the new media industry Classic Story Structure - A combination of independent study and class lecture, this television master class teaches the essentials of dramatic writing in a step by step analysis of dramatic structure. Each student will write a screenplay. 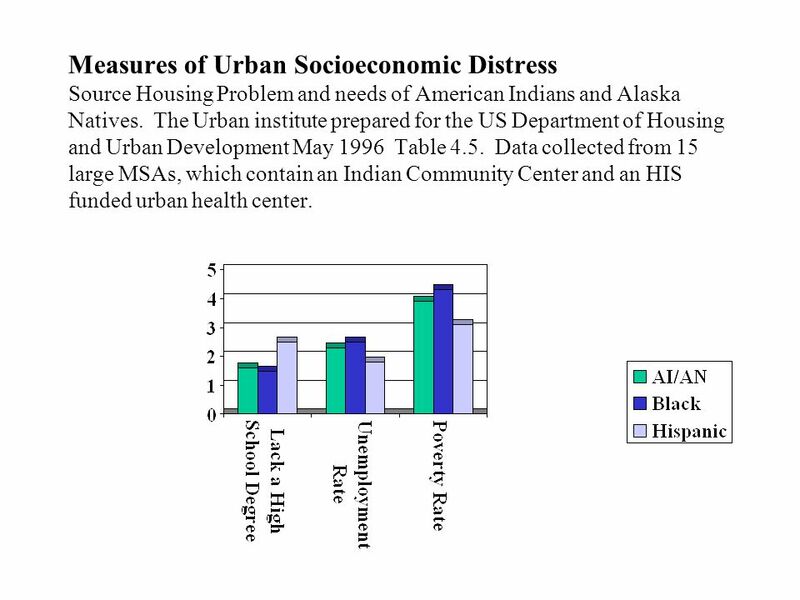 17 Measures of Urban Socioeconomic Distress Source Housing Problem and needs of American Indians and Alaska Natives. The Urban institute prepared for the US Department of Housing and Urban Development May 1996 Table 4.5. Data collected from 15 large MSAs, which contain an Indian Community Center and an HIS funded urban health center. 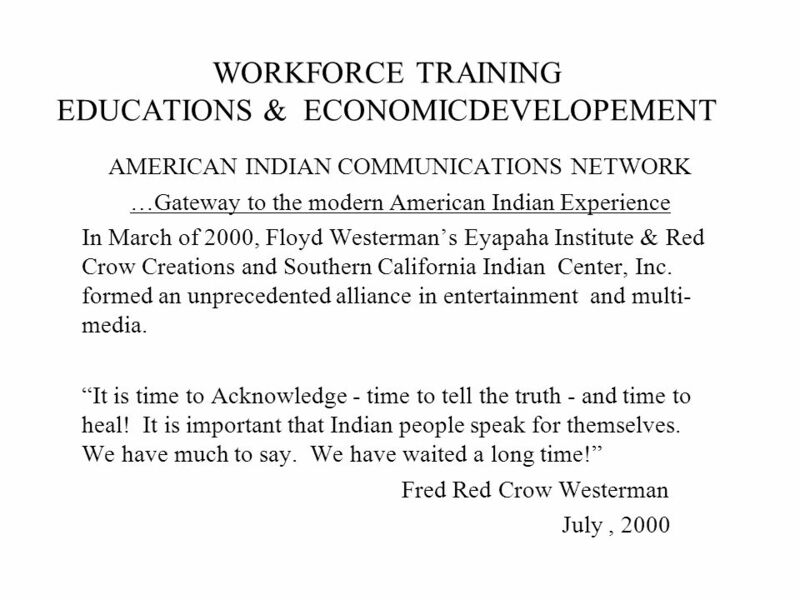 Download ppt "The First Nation Urban Indian Housing Conference EXPANDING THE FOUNDATION FOR SELF-SUFFICIENCY March 28, 2001 Seattle, WA Darrell Waldron, RI &CIC Guy." 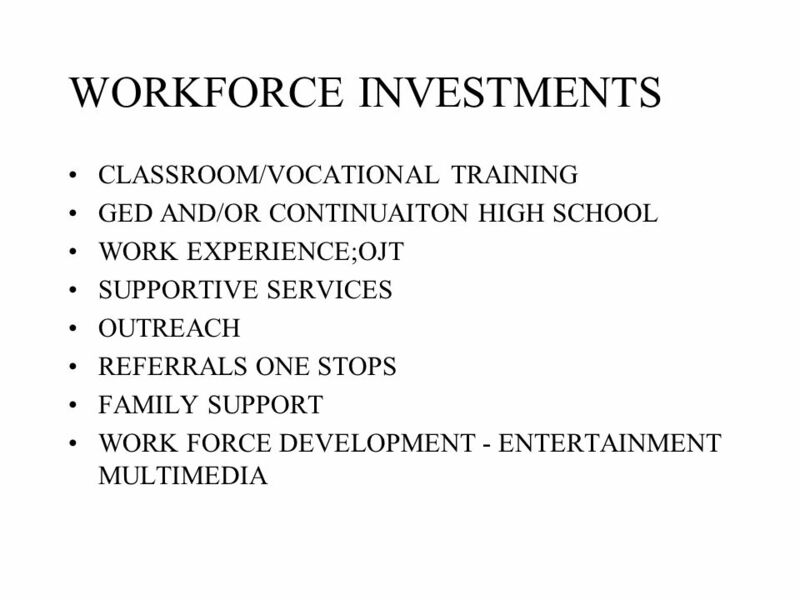 Making a Difference Improving the Quality of Life of Individuals with Developmental Disabilities and their families. 1 Medicare Part D Implementation North Dakotas Efforts. The California Statewide AHEC Program Positioning AHEC Centers in Community Health Center Consortia: A strategy to improve access to and quality of community. I.T. Works Principal Investigator: Peter D. Blanck, Ph.D., J.D. Project Director: James L. Schmeling, J.D. Co-Investigator: Kevin M. Schartz, Ph.D., M.C.S. Group Seminar Field Instruction Model.  1. Delivery of consistent competency based field instruction and augmented case supervision.  2. 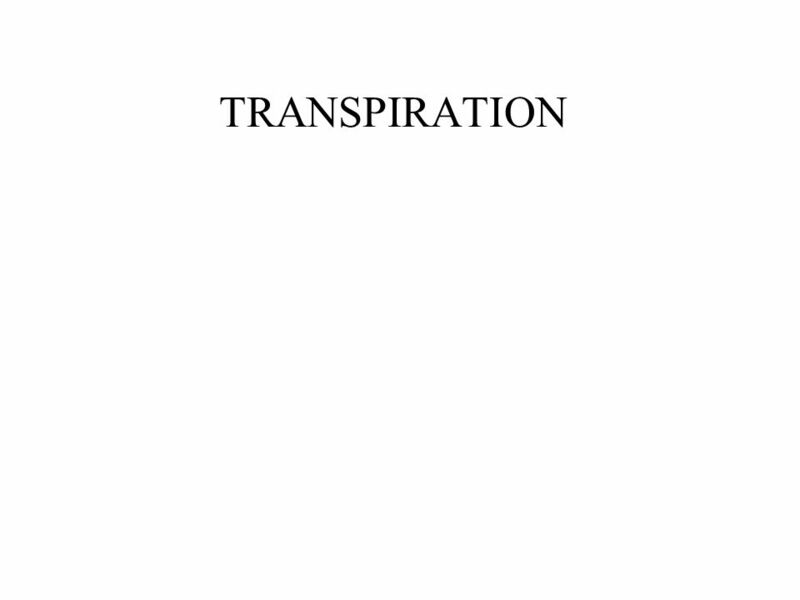 Provision of. A Shared Vision for Youth Arizona State Team September 20-21, 2006 Atlanta, GA.
2011 USBLN Conference1 Moving Talent to the Marketplace – Today and Beyond USBLN 2011. SILC ORIENTATION. Department of Health & Human Services Administration for Community Living Independent Living Administration Centers for Independent. Update on the NPSMA MAGS PSM Meeting Saint Louis, April 4, 2008. Kansas Youth Vision Team: Serving Our Neediest Youth Atlanta, GA September, 2006.